Pierre Menard: Philosophy or Literature? Tri versioj de Judaso, trad. Fernando de Diego, La Ondo de Esperanto, n-ro 6 (37), 1997. "La biblioteko de Babelo," trad. Giulio Cappa, en: Sferoj 2: sciencfikcio kaj fantasto, p.15-24. "La libro el sablo," trad. Liven Dek, en: Sferoj 4: sciencfikcio kaj fantasto, p.15-20. 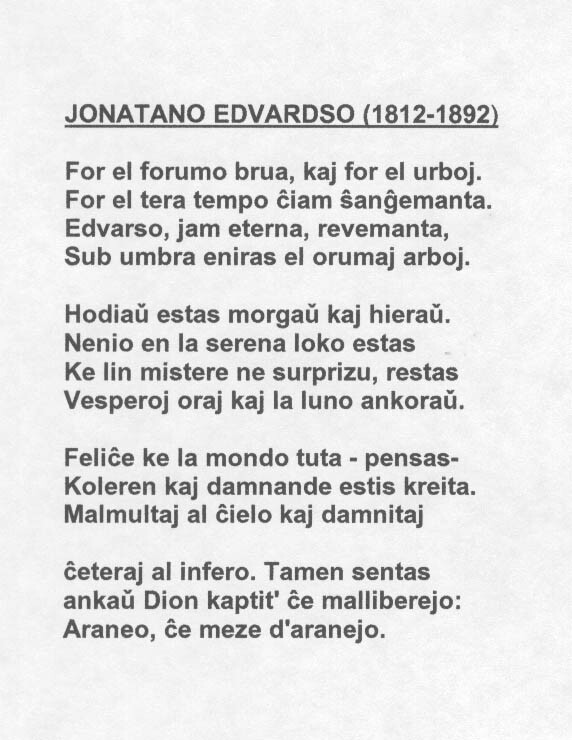 Antologio de Borges en Esperanto eldonota de "Sezonoj". An anthology of Borges' works is slated for publication by "Sezonoj". Obituaries, announcements and a personal note in Esperanto follow below. 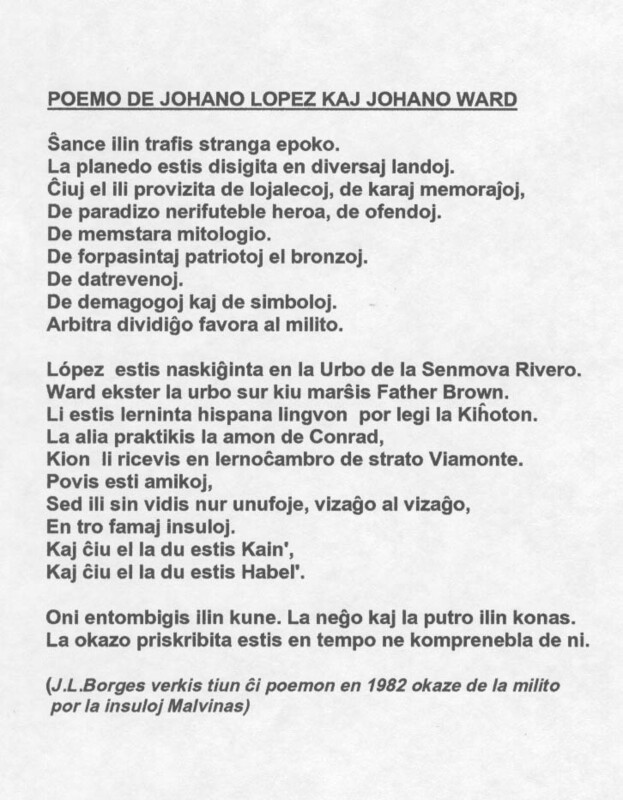 La enterigo de William Auld okazos la 18an de septembro. . . .
Kompreneble, tia evento je tia aĝo ne estas ŝokiga, tamen mi larmis kiam mi legis la novaĵon. Mi studis kurson kiun Bill Auld instruis en Kanado en 1975. Li priskribis sin 'vagabondo'. Li estis afablega kaj festema homo. Ni studentoj pripagis al universitato la kurskotizon, sed Bill insistis pagi la vespermanĝon de la tuta grupo ĉiutage. Stewart, Matthew. The Courtier and the Heretic: Leibniz, Spinoza, and the Fate of God in the Modern World. New York: Norton, 2006. In this comparative study Leibniz comes off as a deluded opportunist, in contrast to Spinoza's radicalism and relative detachment from mainstream Euro-Christian ideology. Leibniz presents an interesting paradox of Enlightenment. One wishes that Adorno and Horkheimer had more to say about Leibniz and Spinoza. The next major impetus for a return to Leibniz came from a resurgence of interest in Jorge Luis Borges. Leibniz was a progenitor of the "universal character" brought to fruition by John Wilkins and subject to fictional treatment by Borges. My first task was to review the writings pertaining to the universal characteristic, ars combinatoria, and logical calculus. See �On the General Characteristic� with listing of other relevant selections in this volume, and Leibniz on the Universal Characteristic, quotations from same. I will save my commentary on these selections for a later date. I did not review the whole volume, but in the process of perusing the volume, I hazarded upon some other essays of interest on which I will comment briefly. Two Notations for Discussion with Spinoza (1676), pp. 167-169. (I) That a most perfect being exists (Nov. 1676); (II) 2 December 1676. On the Ethics of Benedict de Spinoza (1678), pp. 196-206. Dialogue [on the Connection between Things and Words] (August 1677, pp. 182-185. Leibniz refutes the contention that truth depends on thoughts which depend on words/signs/notations. Reflections on the Doctrine of a Single Universal Spirit (1702), pp. 554-560. Leibniz reviews this concept of a 'world soul' or universal spirit and finds it wanting, arguing that particular souls or spirits must also exist as real entities. The single substance of Spinoza is a similarly deficient idea, as is the Neo-Cartesian doctrine that only God acts. The creation of new souls and the soul's immortality are also at issue. Leibniz also offers a curious argument that souls are accompanied by material bodies of some sort, a "subtle body" at the very least (556). The nature of the gestation of animals and death are also examined. The notion of a single universal spirit, albeit a poetic idea, is shown to be deficient in explanatory value. Considerations on Vital Principles and Plastic Natures, by the Author of the System of Pre-Established Harmony (1705), pp. 586-591. Leibniz argues that vital principles belong only to organic bodies. Not every portion of matter is animated though matter consists an infinity of organic bodies. These vital principles do not change the course of motion. (586) Leibniz then explains his principle of pre-established harmony. Letters to Nicolas Raymond (1714-15), pp. 654-660. Letter IV: 11 February 1715, pp. 658-660. Note argument against metempsychosis (658), on the basis that it necessitates inexplicable discontinuous leaps, contrary to the nature of space, motion, and the natural order. I noted a few interesting tidbits pertaining to ethical, legal, political, and anthropological questions. From the Ethical and Legal Writings (1693-1700). IV. On Natural Law, pp. 428-429. Leibniz classifies 'natural societies', with a caveat considering servitude. Reflections on the Common Concept of Justice (1702? ), pp. 561-573. Leibniz is highly skeptical of any justification of slavery and in effect argues against its validity (572-573). Even the distinction of body and soul does not justify slavery, as "a man's body is the property of his soul" (573). Remarks on the Three Volumes Entitled Characteristics of Men, Manners, Opinions, Times, . . . (1711-1712), pp. 629-635. From Ephrata (F-Ra-Ta) to Arkestra by David Stowe. Esoterica, V (2003): 1-26. Parallels are drawn between German mystic, musician, and utopian community leader Conrad Beissel and Sun Ra, on the basis of migration patterns, esoteric and muscial interests, creation of spiritual music communities, and ultimate destination of Philadelphia. Both their trajectories are summarized, and so one gets a capsule history of Sun Ra's intellectual development in relation to the impact of America's inhospitable racism in Birmingham and Chicago and Sun Ra's conscientious objection during World War II. Ra underwent an intensive reading program consisting, inter alia, of Egyptology, Hermetic literature, theosophy, and etymology. His interest in Kabbalah fueled his propensity for punning, wordplay, and reading esoteric significance into all words, taken, as I recall and documented here, to ridiculous lengths. Sun Ra revised a key ingredient of the Afro-American folkore on which he also drew, repudiating Moses and the Exodus story and affirming Egypt as a great civilization instead of an evil slave-state. Most of the information on Sun Ra is taken from John Szwed's biography. As this site is devoted to esoterica, the author is content to cite parallels with implicit approbation, yet this summary alone suffices to convince the critical reader of the pitiful nature of Sun Ra's ultimately reactionary ideological position, perhaps to be designated in an even less respectful manner as his crackpot world view. (Even so, some sifting is warranted, as there are some uplifting tidbits of Sun Ra's wisdom in a mix of decidedly varied quality.) There are numerous lessons in this, but consider for a moment the double alienation involved. Sun Ra sought to negate the imposition of a particular social position imposed upon him, which led to a double negationfirst, of the perspective of white society, secondly, of the 'mainstream' perspective of Afro-American culture. A mystical perspective on history and one's social role was the vehicle for doing this, hardly unique for someone in Ra's position. Such a position led others to orthodox Islam, the Nation of Islam, other cults and sects, homegrown mysticisms, religious eclecticism, not to mention non-mystical alternatives which would demand separate investigation. One conspicuous aspect of Ra's ideology, concomitant with what one would now term its Afrocentric component, is its conservative authoritarianism, with a different twist from that of Elijah Muhammed's fascist personality cult (and from cultural nationalisms to come). Muhammed sought to establish a petit-bourgeois power base in the ghettoes of America. Sun Ra's mythocracy certainly was no such political/economic power move, but a curious attempt to establish a cultural power center, which, by its very nature, could only capture limited attention based on countercultural inclinations among the black populace and not a mass following. See also Mike Heffley's web site. Heffley has engaged in a diversity of enterprises, including extensive scholarship on Anthony Braxton. Thoughts on Music and the Avant Garde: Considerations of a Term and its Public Use by Chris Cutler. May 2005. Appears on the noteworthy web site Perfect Sound Forever. This is in many ways a remarkable essay. A lot can be learned about the driving logic of European avant-gardes, anyway. Here are my general reactions. In short, it [avant-garde rock] has been colonised, flattened and neutralised and all the history has been drained out of itin part because all the history is currently being drained out of history. In my interpretation, I'd say this is true, though Cutler is not entirely specific. (3) Cutler doesn't locate specifically enough, with references to larger social/cultural changes, why the avant-garde is now dead, other than having completed its work, which indeed, I think it has. My position is that something has definitively changed in the past qaurter century. It's senseless to attempt to pinpoint a cutoff datehistory doesn't work like thisbut there's a definitive difference (in the USA, and perhaps other Western countries) between the world of the 1970s and the new cultural mode of being that firmed up in the 1980s. (5) After reviewing a century of European and white American avant-gardes, Cutler finally turns his attentionin Section XII, Dominoes to Black American avant-garde jazz. What Cutler says about it rings true, but there's much more to be said, especially about possible differences between the black avant-garde and some of its white counterparts. This dovetails into my personal biases and memories of the 1970s. (6) While generalizations are a mine-field, I'll hazard mine, because there's an important principle involved. The situation of black artists prior to the 1980s was qualitatively different in key respects from that of whites who were just as much in opposition to the mainstream social and cultural order. The difference, however, is that blacks had different raw material to draw upon and somewhere to go. The "literature of exhaustion," the culture of decay, dissolution, and dehumanization, would be mighty hard to find among black avantgardists, though similar tones of existentialism and alienation would certainly be sounded. This contrast was very striking to me 30 years ago, as I turned my back on the culture of nihilism and meaninglessness. Noticeable to me in this regard is the loss of deliberativeness and intention and the cult of randomness (which is not necessarily the ideology of free jazz, which needs to be analyzed and criticized separately). See my brief comments on Christopher Lasch's The Minimal Self. Here Cage demonstrates yet again what a useless jackass he was, as opposed to where real cultural vitality could be found. You see, by the late '70s, I could no longer tolerate white people wallowing in their own excrement, which is why, when I was first unexpectedly exposed to punk, I violently rejected it. I was grooving on Sun Ra and wasn't going to allow the culture of self-debasement to invade my life. (7) There never was an impermeable barrier between black and white avant-garde and experimental musics. There is too much detail to detail here. I've seen Oliver Lake and Roscoe Mitchell in tails as composers and/or performers of the same kind of disjointed squawk music produced by academic music departments. I've seen "new music" concerts featuring a diversity of performers. Upon occasion I noticed some perceptibly different approaches. For example, the World Saxophone Quartet would excite me where others would kill me with tedium (including a famous minimalist composer whose name slips my mind). Anthony Braxton can't even be categorized. This is a jumble, but there's so much to be said, for another time, I suppose. While we are at it, here is my reaction to Jazz: Myth and Religion by Neil Leonard (New York: Oxford University Press, 1987). Interesting, but somewhat different from my perspective. Or, more accurately, a number of distinguishable phenomena are bundled together in the book, which I would be interested in distinguishing so as to concentrate on the more serious aspects. That is, there are several cult-like aspects to jazz, but the aspect of ritualism and spirituality that interests me the most is the experience of playing and hearing the music itself, rather than hero worship, personality cults, orthodoxies, etc. (9) "It's the '70s, stupid! " I say this whenever it's time to examine how we got to where we are today. This slogan is relevant to Cutler's thesis, but I'm not going to proceed down that path at this moment. Anyway, that era has ended. Rather than being nostalgic, I'll make only a few critical comments, as I've expounded on the general topic elsewhere. An explosive, high-energy historical moment is difficult to sustain. There's a meltdown, a cool-down, and ultimately reversion to a more stable form of expression. Both the high points and the weak points deserve to be preserved in memory. Random noise as the ultimate expression of the dubious ideology of total spontaneity ultimately becomes boring. Music without structure cannot create passion and is thus a waste of time, with this one exception: energy music can lose structure without becoming pointless if it sustains emotional meaning, as in fact did happen sometimes. (But how many saxophonists can scream like Pharoah Sanders?) On the other hand, as this geriatric avant-garde music of the '60s and '70s entered the 21st century, it was already degenerating into noodle doodle as tedious and insufferable as anything Caucasian 'new music' could bore the crap out of us with. (I noticed young folksmigrants from the rock fringedigging on the Visions Festival in New York while a friend and I were bored out of our gourd.) But, on the flip side, there is an ideological dimension in the reprehensible attempts of Wynton Marsalis and Ken Burns to bury the '60s historically. From the standpoint of what Marsalis is attempting to preserve, it must be noted that American music can't survive as a museum piece like the European classics. There must be a vital link between the production of music and the changing context of sensibility. Then, if one's cultural ground erodes, one must figure out how to mourn the past. But there's another past to mournthat of the '60s and '70s. Anthony Braxton has spoken eloquently on the finest elements of his generation and the heritage that has been lost for a larger public. It's time to revisit and reassess this historical development. While you are at it, check out the numerous invaluable archival video offerings on YouTube. This essay has been anthologized repeatedly. I am working from "New Refutation of Time" (1947), translated by Ruth L. C. Simms, in Borges, A Reader: A Selection from the Writings of Jorge Luis Borges, edited by Emir Rodriguez Monegal and Alastair Reid (New York: Dutton, 1981), pp. 179-191. If published at the middle of the eighteenth century, this refutation (or its name) would endure in the bibliographies of Hume and perhaps would have been mentioned by Huxley or Kemp Smith. Published in 1947after Bergsonit is the anachronous reductio ad absurdum of an obsolete system or, what is worse, the feeble machination of an Argentine adrift on the sea of metaphysics. Both conjectures are verisimilar and perhaps true; to correct them I cannot promise a startling conclusion in exchange for my rudimentary dialectic. The thesis I shall expound is as ancient as Zeno's arrow or the chariot of the Greek king in the Milinda Pañha; whatever novelty it possesses consists in the application of Berkeley's classic instrument to that end. Berkeley and his successor, David Hume, abound in paragraphs that contradict or exclude my thesis; nevertheless, I believe I have deduced the inevitable consequence of their doctrine. In the course of a life dedicated to literature and, occasionally, metaphysical perplexity, I have perceived or sensed a refutation of time, which I myself disbelieve, but which comes to visit me at night and in the weary dawns with the illusory force of an axiom. This refutation permeates all his books and is anticipated in early poems, stories, and essays. Now it is time to consolidate the argument. It is driven by 'Berkeley's idealism and Leibniz's identity of indiscernibles', with contributions by Schopenhauer and Hume. Borges proposes to take idealism a step further. Once the Cartesian ego is rejected, and all that remains are impressions, the order and continuity of time is open to question. Borges tries out a couple of thought experiments. The first is Huckleberry Finn awakening on the river at night. The second denies the simultaneity of two unconnected events in 1824. Each event is an island. The universe, the sum of all the events, is a collection that is no less ideal than that of all the horses Shakespeare dreamedone, many, none?between 1592 and 1594. Next, Borges works on a different argument: the numerous repetitions of experience make separate events merge into one another, and allegedly separate moments become identical. Having postulated that identity, we must ask: Are those identical moments the same? Is a single repeated term enough to disrupt and confound the series of time? Are the enthusiasts who devote a lifetime to a line by Shakespeare not literally Shakespeare? As for the ethics of this system, Borges doesn't take a stand, but cites the Mishnah, George Bernard Shaw, and C. S. Lewis. Yet another segment of Borges' argument goes like this. Language is temporal and unequipped for the eternal. Borges recounts an experience from a story of his written in 1928he has described a similar or identical situation elsewherein which past and present experience merge into an undifferentiated whole, which he correlates with 'eternity' (and immortality). It is the repetition of the same, and thus the nullification of time. The second version of the essay, comprising the second part of the published piece, recounts the history of idealism, the hoariest of philosophies. Borges reviews Berkeley's argument against the independent existence of matter as well as Spencer's inadequate attempt to refute it, and from there Borges pursues an argument parallel to that in the first version (part) of the essay, with the addition of Chuang Tzu's famous dream. To deny time is really two denials: the denial of the succession of the terms of a series, the denial of the synchronism of the terms of two series. In fact, if each term is absolute, its relations are reduced to the consciousness that those relations exist. The negation of time can take on different interpretations. Borges takes the opposite approach of Bradley: he rejects the whole in order to glorify the parts. Schopenhauer makes a comparable statement. A Buddhist text denies the continuity of time altogether, recognizing only the reality of individual moments, only of the present moment. And yet, and yetto deny temporal succession, to deny the ego, to deny the astronomical universe, are apparent desperations and secret assuagements. Our destiny (unlike the hell of Swedenborg and the hell of Tibetan mythology) is not horrible because of its unreality; it is horrible because it is irreversible and ironbound. Time is the substance I am made of. Time is a river that carries me away, but I am the river; it is a tiger that mangles me, but I am the tiger; it is a fire that consumes me, but I am the fire. The world, alas, is real; I, alas, am Borges. This must be the most thoroughgoing and revealing metaphysical essay in Borges' oeuvre. It was on the basis of this essay that I defined Borges over three decades ago. (The conclusion to Avatars of the Tortoise is next in rank in my memory.) I plan to write an extended analysis with this essay as the capstone, but for now I'll outline a few thoughts. (1) How does this essay fit into the genre schema of Jorge Gracia: does it belong to philosophy or literature? But for the prologue and the concluding statement cited above, it could just about pass for philosophy. It is, admittedly, highly literary, with passages too literary and text-specific to be considered merely a philosophical tract; still, this is a borderline case. (But really, in comparison with some of Nietzsche's texts?) As a thought experiment it fits into philosophy, but as the author raises doubt as to his commitment to his own argument, it might be taken for a mere literary exercise. But then, what is the role of irony in philosophy? (2) The fact that Borges was a literary man rather than a professional philosopher probably gave him latitude to take certain conceits to their logical conclusions, shamelessly exploiting the ultimate consequences of subjective idealism as well as esoteric lore without inhibition, thus teaching us something about the idealist and esoteric modes of thought without insinuating acceptance by us. I want to explore further what that something is and how it would look from a de-alienated perspective. (3) For all of my adult life, Borges was for me the ideal idealist philosopher. I never took idealism seriously, but Borges made it interesting and spurred idealism to its ultimate absurd conclusion. I considered this as a reductio ad absurdum argument, not remembering that Borges himself characterizes his argument in this fashion. I may also have forgotten that Borges undermines his own text by claiming to disbelieve in it and finally wistfully resigning himself to reality. (4) Three decades ago I did not consider this in terms of genres and probably not with regards to the philosophical import of intended irony. But from my current perspective I see irony as enhancing the epistemological value of the text. (See the conclusion to my review of Gracia.) Perhaps an analogy can be drawn from René Menil's contrast between Césaire and Senghor. More from Selected Non-Fictions [SNF], edited by Eliot Weinberger; translated by Esther Allen, Suzanne Jill Levine, and Eliot Weinberger. (New York: Viking, 1999). Final section of the book is section VII: Dictations 1956-1986. Borges' lectures and prologues are very interesting; my goal here though is only to single out passages relevant to the themes I'm exploring. Borges discredits the hypothesis that someone other than ShakespeareBacon or Marloweauthored Shakespeare's works. [...] Coleridge used Spinoza's vocabulary in praise of Shakespeare. He said that Shakespeare was what Spinoza calls "natura naturans," creative nature: the force that takes all forms, that lies as if dead in rocks, that sleeps in plants, that dreams in the lives of animals, which are conscious only of the present moment, and that reaches its consciousness, or a certain consciousness in us, in mankind, the "natura naturata." Borges analizes the belief in immortality and finds the possibility of personal immortality undesirable as it is unlikely. He examines alternative notions, and concludes that the ego is the least important entity to survive. The experiences, perceptions, thoughts, and feelings, detached from the ego, are reenactments of what existed in the past; they merge into one another and survive impersonally. We could say that immortality is necessarynot the personal, but this other immortality. For example, each time that someone loves an enemy, the immortality of Christ appears. In that moment he is Christ. Each time we repeat a line by Dante or Shakespeare, we are, in some way, that instant when Dante or Shakespeare created that line. Immortality is in the memory of others and in the work we leave behind. What does it matter if that work is forgotten? I have devoted the last twenty years to Anglo-Saxon poetry, and I know many Anglo-Saxon poems by heart. The only thing I don't know is the names of the poets. What does it matter, as long as I, reciting the poems from the ninth century, am feeling something that someone felt back then? He is living in me in that moment, I am that dead man. Every one of us is, in some way, all the people who have died before us. And not only those of our blood. Of course, we inherit things in our blood. I knowmy mother told methat every time I recite English poems, I say them in the voice of my father, who died in 1938. When I recite Shakespeare, my father is living in me. The people who have heard me will live in my voice, which is a reflection of a voice that was, perhaps, a reflection of the voice of its elders. The same may be said of music and of language. Language is a creation, it becomes a kind of immortality. I am using the Castilian language. How many dead Castilians are living within me? Every one of us collaborates, in one form or another, in this world. Every one of us wants this world to be better, and if the world truly became better that eternal hopeif the country saved itselfand why can't the country save itself ? we would become immortal in that salvation, whether they know our names or not. That is the least important; what matters is that immortality is obtained in works, in the memory that one leaves in others. My opinions do not matter, nor my judgment; the names of the past do not matter as long as we are continually helping the future of the world, our immortality. That immortality has no reason to be personal, it can do without the accident of names, it can ignore our memory. For why should we suppose that we are going to continue in another life with our memory, as though I were to keep thinking my whole life about my childhood in Palermo, in Adrogué, or in Montevideo? Why should I always return to that? It is a literary recourse; I could forget all that and keep on being, and all that would live within me although I do not name it. Perhaps the most important things are those we don't remember in a precise way, that we remember unconsciously. Hinton has been virtually forgotten, but he was a pioneer of science fiction (antedating Wells), writing fiction as well as philosophical treatises on four-dimensional geometry and flatlands. (Aficionados of Edwin Abbott's Flatland likely know of Hinton and the late 19th century preoccupation with the fourth (spatial) dimension. Words and Things, A Critical Account of Linguistic Philosophy and a Study in Ideology. London: Gollancz; Boston: Beacon, 1959. Language and Solitude: Wittgenstein, Malinowski and the Habsburg Dilemma. Cambridge: Cambridge University Press, 1998. The first book made history. The second is an extraordinary critique of Wittgenstein. Others have a less favorable view of Gellner's Words and Things. Uschanov's analysis begins by claiming that Ernest Gellner was all wrong. (But what about golf?) Gellner was especially wrong about Wittgenstein, but he was also wrong about ordinary language philosophy (OLP), says Uschanov. I had some problems with Uschanov's analysis, but it stimulated some general thoughts on the social history of philosophy. Gracia, Jorge J. E. Borges's Pierre Menard: Philosophy or Literature?, The Journal of Aesthetics and Art Criticism, vol. 59, no. 1, Winter 2001, pp. 45-57. The following was written 25 July 2004.
. . . a couple of summers ago . . . asked for my opinion on why we seem to be unable to deploy a perceived conceptual structure within a literary work to capture the full content of that work. For some reason this article reminds me of that conversation. It is a peculiarity of the interpretation of works of art that the rational element in them (that which is soluble by reason) is almost never their true reality, but only a veil which hides their form. Insofar as a soul needs a bodywhich there is no disputingan artist is bound to derive the means of creation from the natural world. But the chief thing is still the artistic conception. . . . [In Faust] everything points with growing mastery toward his final supreme momentwhich, though beyond expression, touches the very heart of feeling. From this, Gracia adumbrates the modernist view of the difference between philosophy and art: philosophy is translatable while art is not. The postmodernist argument, on the other hand, erases the distinction and reduces or identifies philosophy and literature. This has become an issue for Latin American philosophers as their tradition seems to be favored by the postmodern but not by the modern view. The most cited author in this regard is Jorge Luis Borges, a philosophical as well as literary author. So is Borges' short story "Pierre Menard, the Author of the Quixote" philosophy or literature, and if there is a distinction between the two genres, what is it? My thesis about Borges's "Pierre Menard" in particular is that it is a literary work and text rather than a philosophical one. My thesis about philosophy and literature in general is that literary works are distinguished from philosophical ones in that their conditions of identity include the texts they express. Moreover, literary texts are distinguished from philosophical ones in that they express literary works. A literary work is distinguished from a philosophical one in that its conditions of identity include the text of which it is the meaning." Thus literary works are untranslatable. A philosophical work should be translatable. A literary text is essential to the work it expresses, but a philosophical text is not. Gracia pursues the arguments for and against this curious thesis. Various properties of literary texts including the style distinguish them from philosophical texts. Though "Pierre Menard" has philosophical characteristics, it can be shown to be not fully translatable. This theory runs into a number of problems, so Gracia pursues the links between identity, identification, and causation. By the stringent criteria outlined here, several works commonly accepted as part of philosophy might have to be expelled and pushed into literature. Hence Gracia attempts to address this problem by pursuing these linkages. However, what happens if we are able, e.g. in the case of Descartes' Discourse on Method, to establish that this is a work of philosophy, a text of philosophy, a work of literature, and a text of literature? Gracia offers to alternative solutions: (1) Two Text-Two Work alternative, (2) One Text-One Work alternative, which he prefers. I re-read Gracia's article within the past two months. Wrapping my head around his thesis is still an effort, but I'm better prepared to accept his thesis with respect to Borges after reading a considerable body of Borges' fictional and non-fictional (not always easy to distinguish) output. Borges' work obviously has considerable philosophical content, but there is a narrative dimension in it which may be said to transgress the bounds of the philosophical genre, assuming that all recognized philosophical works can be jammed into that category, an assumption I still tend to balk at. Aren't there philosophical texts of a highly literary nature bound to their formand what about irony? I think that several of Borges' essays might qualify as philosophy, but I'll grant that the fiction is more tightly bound to the form and thus not paraphrasable without loss of its identity. "Pierre Menard" is not only a philosophical thesis; it is a literary fable or tale. Then there's an additional question not posed by Gracia: what changes about philosophy when it takes up residence as literature? Does philosophy then have a greater latitude of being taken ironically? See my essay For Rene Menil, Caribbean Surrealist-Philosopher. As for me, my clarity grows stronger each day. My project this week is to achieve clarity without putting myself in proximity to too much stimuli which will provoke my anger. Last week I mixed my clarity with my fury. I don't plan to overcome my anger at all, but I do plan to aim for crystal clarity whatever my emotional state, and to arrange my life as much as possible to avoid excessive doses of other people's noise which would only provoke my own irritation. Rather than being either a space cadet or a totally down-to-earth person, I am negotiating those two extremes by means of a tightly organized dialectical relationship between the inspired world of the mind and the horribly tough world of everyday life. Hence my powers of observation grow more acute as I survey the relationship between my own mind and the conversations that other people are holding. I make new advances each day. You would not believe how rich in detail and moral lessons are each mundane event of waking life. It is painful at times to be in this position, but I'm luckier than most, because I have much leeway in disposing of my time and energy, while most people are crushed by the social routine, mostly of holding down a job, and the unpleasantness of social relations. But I'm listening more closely to people's conversation, which is mostly insipid, but which reflects the burden they are under. Is it any coincidence that the conversation at the café today was all about two and only two topics: racism and computers? I tried to inject some clarity even in my cautious interventions into other people's conversation. Not every one can listen or understand. Which means I have to be even more razor sharp. But I'm telling you, this is an exacting discipline. I have to do it, because I can and nobody else can. It is an exacting discipline, and how awful it is that as difficult as it is to be a human being under any circumstances, a human being under capitalism in this epoch, it is even more outrageous that one cannot simply be a human being first without this heavy oppressive burden of race hanging over one's entire life. The fundamental issue, though is the human dilemma, and how sadly not just our bodies are limited by circumstance, but our emotions and thoughts. Anyway, I am trying to evolve a new literary form in which to express this clarity. It involves a continuous, alternating unpacking and repacking of tropes, of abstractions and details, contractions and expansions, a dialectical interchange between the outward and the inward, as one disappears to emerge converted into the other. It is a severe discipline, that not many people understand because of their inner static. Intellectuals are the worst. Still sad are people who have keen minds but expend them completely in the banalities of social living, lacking that divine spark that raises one above the merely utilitarian. Yet that divine spark gets no free ride floating about on nothing; it has to test itself in bitter experience. The results of this methodology, written in this new formthis is what I need to publish. I have spent the past week at an ultrasonic pitch of psychic intensity, writing like a madman, undoubtedly convincing all my friends that I am one. Doesn't bother me. Gone fishing for souls. Having a great time, but everybody can't be here. Now before one adapts to whatever form is necessary to circulate in this world, one has to discover one's own form and see if it lives up to its own logic. If one is strong enough and the light breaks, that form will find a place for itself. Either way, it has to be what it is first before it can adapt to something else. Now how to aggregate an accumulation of densely packed (oy!) missives? I don't just want to unpack my tropes in usual trite fashion. I may have to untrope or retrope somebody else's unpacking, I may have to repack somebody else's tropes or untropes. May have to continually pack and unpack my own. So how about this? A literary entity called CONTRACTIONS AND EXPANSIONS. Section one: Series of missives written in chronological order, with some kind of numbers attached. Curious combination of packed and unpacked material. This is contraction or tension (though possibly containing some orgasmic releases). Second section: expansions or releases, guess this would have to be unpackings keyed to the numbers in section one. How to unpack and lay out all the items neatly and clearly arranged? How to avoid giving into the temptation to repack? How does this form differ from the usual form of text and footnotes (or in the case of the catalog, footnotes and text)? How does it differ from The Ancient Mariner, or other renegades and castaways? Adorno's introversion in the face of external defeat reminds me of my own intense meditations of August 1997, in which I face the tortuous inversions of materiality to ideality and back again, both unpacking and densely repacking my tropes, culminating in my projected work "Contractions and Expansions" . . . I think the reason I remember this koan [alternate translation] alone after three decades or more is because it made perfect rational sense to me. Otherwise, I am rather averse to the whole procedure. All the times I have seen this koan quoted, until I surfed the net for it tonight, the very ending, which includes commentary by Mumon, has been omitted. The heretofore missing piece actually spoils for me what is otherwise a perfect parable. In my view, the finger (or thumb as it is often translated) is itself irrelevant: just about any gesture would do, as long as the logic of the scenario were preserved. I insist on making sense out of things, and the commentary by Mumon, which of course I am taking as is without regard to whatever context is relevant to understanding these stories, doesn't gel for me. I don't expect this to be intelligible as it because it is just a tiny window onto a big project of mine. But for me a number of abstract principles fell into place as I walked in the hot sun to the metro stop, and out of them I coined a number of aphorisms, a form which is very useful as its concentrated austerity implies volumes. So I made mental notes of six or seven ideas in the midst of my postmortem review of the above commentary, and then repeated them mentally so I could write them down later in the subway train. Along the way I remembered this koan. I don't recall what prompted it at the moment, but I've had it in mind for some time to look up because it is apropos to a number of my arguments regarding intellectual independence and how thinking things through from the inside out differs from parroting ideas. Or, in another scenario: simply using source texts as so much offal for mechanical processing by the sausage grinders of theory factories, which in my work over a dozen years is all I saw people do. If you think Wittgenstein and Popper were irascible, you should have seen me slugging it out with the likes of what academia produces in social theory, cultural studies, and literary criticism aaaaaaarrrrrrrrrrrgh! In the summer of 1997, after hitting a brick wall with these people, several of them gathered into a single room, at an event made possible in part by my organizational role, I came to some drastic conclusions, and was subsequently forced into a mode of expression in which I had to retreat from the explicit, logical elaboration of ideas into a highly concentrated, condensed, packed, aphoristic, ironic form of expression, which also takes a great deal of concentration and logical insight to effect, because I could not trust my audience, and my only recourse was to embody an irreconcilable difference of perspective in the form as well as content of expression. (Years later I tried to explain my literary form to a friend, but I failed completely. He did suggest, however, that I take a look at the form of Philosophical Investigations, advice I have yet to follow.) So everything I wrote for the next couple of months involved a sequence of contractions (aforementioned condensations) and expansions (logical elaborations), back and forth in rapid succession from one pole to the other, which coincided precisely with intense psychological fluctuations. And in this process I detected an overall pattern, a dizzying logic of inversions, which felt something like what Blake must have felt turning the perceptible physical and social universe inside out, bringing to light the complementary logical structure and inverse properties of a mental universe unknown to official societya process he called Mental War. Too many of our fellow citizens have been killed and no one knows where they are buried. Who can erect a monument to their memory? Music alone can do it. Borges' essays appear in several volumes, the earliest in English being Other Inquisitions (1937-1952) (1964). The most comprehensive collection is Selected Non-Fictions [SNF], edited by Eliot Weinberger; translated by Esther Allen, Suzanne Jill Levine, and Eliot Weinberger. (New York: Viking, 1999). The next largest selection is in the out-of-print Borges, A Reader: A Selection from the Writings of Jorge Luis Borges [BAR], edited by Emir Rodriguez Monegal and Alastair Reid (New York: Dutton, 1981). I shall draw on these latter two volumes for my review, indicating with initials which volume(s) the essays mentioned can be found in. See earlier Borges entries for links and mentions of other essays. A Summary of Zeno's Paradox, its refutations by Aristotle, Bergson, and Russell, and the view of William James. Borges' returned to this subject later. See also "Avatars of the Tortoise" (1939). The combinatorics underlying Nietzsche's argument for Eternal Return are destroyed by Cantor's work on infinite sets. There is a precedent in Augustine's refutation of the Stoics and Pythagoreans. Mill also refutes Nietzsche avant le lettre. Nietzsche denied atomic theory and attempted to emplor thermodynamics. An examination, inter alia, of the impossible doctrines of (Neo-)Platonism. There is also a consideration of realism vs. nominalism. Finally, Borges reiterates his 'impoverished' 'personal theory of eternity', based on an experience of the erasure of time distinctions, published in his 1928 book The Language of the Argentines. Borges assesses Llull's thinking machine (composed of movable disks enabling myriad combinations of elementary ideas) useless, an absurdity for philosophical purposes but perhaps useful as a literary device. Borges adduces two diagrams, the first a diagram of divine attributes, the second, of Llull's thinking machine. It unworkability is illustrated by Borges using one of his favorite symbols, a tiger. The device is ridiculed in Swift's Gulliver's Travels. Of the first diagram, Borges suggests that the theological subject matter would not be rewarding today. Borges takes up artificial language in later essays and stories. Projects, languages and figures mentioned here are: John Wilkins, Letellier, Volapük (Schleyer), Esperanto, Neutral Idiom, Interlingua (Peano), Dr. Henry Sweet, with a sample sentence in Idiom Neutral. Borges traces the lineage of the notion of the Total Library and links it to the combinatorics of atomism and Raymond Llull. People cited include Democritus, Leucippus, Aristotle, Cicero, Leibniz, Pascal, Swift, Nietzsche, T. H. Huxley, Lewis Carroll, Gustav Theodor Fechner, Kurd Lasswitz, Theodor Wolff. On Zeno's paradox and infinite regress. Cast: Zeno, Plato, Aristotle, Hui Tzu, Chuang Tzu, Agrippa, Acquinas, Lotze, Bradley, Lewis Carroll, William James, Russell; and Schopenhauer and Novalis on the dreamed world. This is up near the top of Borges' essays illustrating his central themes. See also "The Perpetual Race of Achilles and the Tortoise" (1929). On Dunne's theory of time, based on an infinite regression of time lines. On 4-dimensional geometry, inifinity, paradoxes, etc. On causality, determinism, and linear vs. cyclical timeMill, Laplace, Nietzsche, Spinoza, Russell, Chateaubriand, creationism vs. evolutionism, and Gosse, who postulated 'a rigorously causal, infinite time that has been interrupted by a past Act: the Creation.' The remains of the entire chain of evolutionary causality exist, but only those Creatures which postdate the Creation really existed. Cast: Plato, Marcus Aurelius, Hume, Schopenhauer, Nietzsche, Russell. It is as if Melville had written, "It's enough for one man to be irrational for others and the universe itself to be so as well." Universal history prolifically confirms that terror. Borges sets aside his customary nominalism to celebrate England's victory in the war. Against the Platonic conception of the State, nationalism, and national character. The Argentine cannot identify with the State; only personal relations are real to him, in contrast to the mentality of Europeans and North Americans. In a world menaced by communism and Nazism, Argentine individualism, dubious as it might be, may yet provide an antidote to statism. Borges' affirms Wells' nominalism, but criticizes Wells for not always practicing what he preaches. Spinoza is also mentioned: God neither loves nor hates anyone. See also "A Note on the Peace" (1945). In the middle of the review: "Wilde has been accused of practicing a kind of ars combinatoria, in the manner of Ramón Llull'. A footnote mentions Leibniz's fatalism. This is Borges' most important statement of his engagement with idealism. I will discuss this separately at a later date. More important than Carlyle's religion is his political theory. His contemporaries did not understand it, but it can now be summed up in a single household word: Nazism. From polytheism to monotheism to pantheism and negative theology. On God and Shakespeare as everyone and no one. See also > Borges (2). On universal history and the cosmic sphere, from the ancient Greeks to Pascal. Universal history may consist of variations of a few metaphors. For Bruno, the prospect of an infinite universe was a liberation, for Pascal, a nightmare. Fulsome praise for Bradbury, with mention of precursors: Lucian of Samasota, Ariosto, Kepler, John Wilkins (of 'universal character' fame), Wells. SNF: I have only to finish section VII. Dictations 1956-1986. Will report back. Other Inquisitions (1937-1952): Includes For Bernard Shaw. There is an essay on Shaw of interest to me; perhaps this is the one.